"Bang! 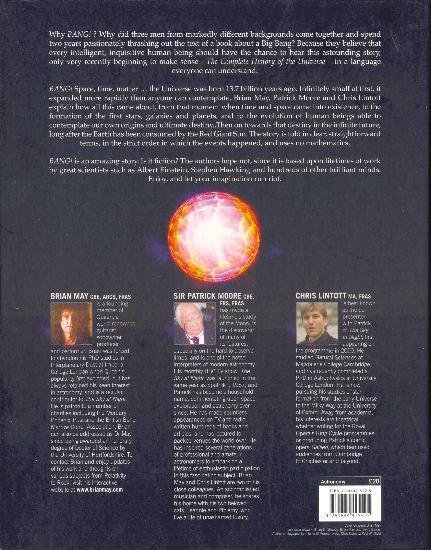 The Complete History Of The Universe" was published on 16 October 2006, and was written by Brian May with 'The Sky At Night' presenters Sir Patrick Moore and Chris Lintott. A second, updated edition, was published on 1 October 2007. The book features 192 pages and explains how the universe began, in everyday language. 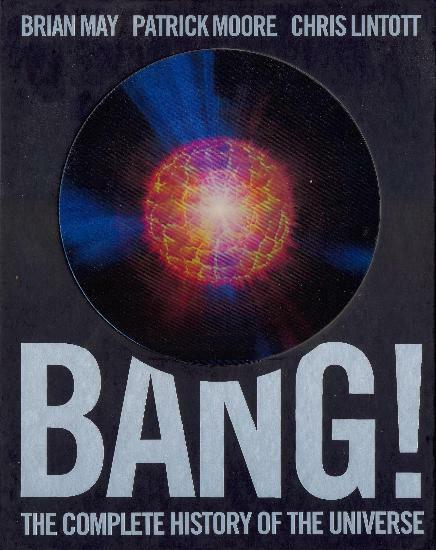 The front cover features a hologram of a star exploding, and the book contains many stunning photographs, some of which were taken by Brian during and since his studies. To date the book has sold over 150,000 copies in thirteen different languages. A follow-up book, 'The Cosmic Tourist', was later published in 2012. 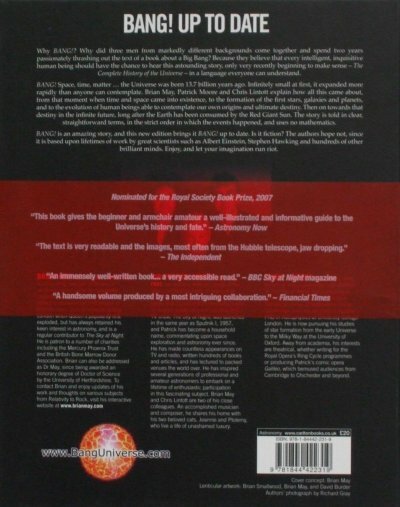 Scans of the book appear towards the end of this page, while more information can be found at the book's website, http://www.banguniverse.com/. the Universe was born 13.7 billion years ago. Infinitely small at first, it expanded more rapidly than anyone can contemplate. After a millionth of a second, it was the size of our entire Solar System. By the time one second had passed, it was more than 10 billion kilometres across. Today, it stretches further than we can see  the furthest we can see using the best telescopes we have is 13.4 billion light years (more than 100,000 billion billion kilometres). In BANG! The Complete History of the Universe, authors Brian May, Patrick Moore and Chris Lintott (Patrick Moores co-presenter on The Sky at Night) explain how all this came about, from that moment when time and space came into existence, to the formation of the first stars, galaxies and planets to the evolution of human beings able to contemplate our own origins and ultimate destiny. Then, on towards that destiny in the infinite future, long after the Earth has been consumed by the Red Giant Sun. This story is told in clear, straightforward terms, in the strict order in which the events happened, and uses no mathematics. 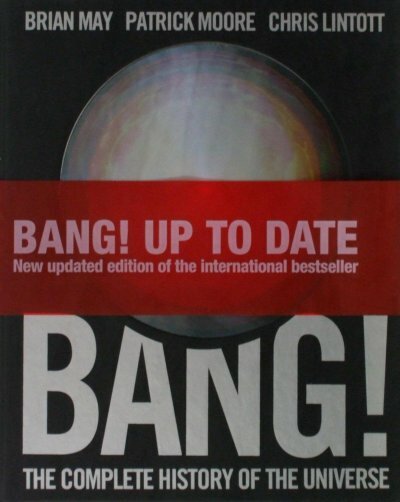 Readers of BANG! do not need to know anything on this amazing subject before their journey begins. In fact, BANG! is the first book to make all the very latest leading-edge research on the subject accessible enough for a complete novice to understand. Brian May ARCS, CBE, FRAS is a founding member of Queen, a world-renowned guitarist, songwriter, producer and performer. Brian was forced to abandon his PhD studies in Interplanetary Dust at Imperial College, London, when Queens popularity first exploded, but has always retained his keen interest in astronomy and is a regular contributor to The Sky at Night. He is also known as Dr May, since being awarded an honorary degree of Doctor of Science by the University of Hertfordshire. Sir Patrick Moore CBE, FRS, FRAS has specialised in the study of the moon, and is one of the best known interpreters of modern astronomy. His monthly BBC TV programme, The Sky at Night, was launched in the same year as Sputnik 1 (1957) and Patrick has been commentating upon space exploration and astronomy ever since. He has made many appearances on TV and radio and written hundreds of books and articles. He has lectured to packed venues the world over. He has inspired several generations of professional and amateur astronomers to embark upon a lifetime of enthusiastic participation in the subject. Brian May and Chris Lintott are two of his close colleagues. He is also an accomplished musician and composer. Chris Lintott PhD, FRAS is best-known as the co-presenter, with Patrick, of The Sky at Night. He took his first degree in Physics at Cambridge, then his PhD in Astrophysics at University College London, and is now doing further research at Oxford. He has a particular interest in star and galaxy formation and astrochemistry.